End of week news that raises eyebrows. In case anyone was sleeping and missed the news (not that main street didn’t already know) the jobs market is terrible and unemployment rose to 9.2%. 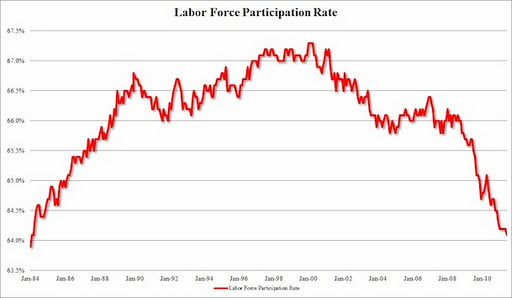 Buried in the headlines though was the much more ominous number of declining participation rate (number of work-age people actually in the workforce) which hit a new 25 yr low. 44.6 million people are now on food stamps…an increase of 4.3 million over last year. The US govt with no clue what to do is attempting to divert attention away from the lack of economic improvement to the debt ceiling/budget debate. Granted this is a massive problem, but it cannot be solved on it’s own with increasing the number of people in good paying jobs. Though government cannot itself create a job market, it can get out of the way of businesses that can. It can have trade agreements that are more favorable to the US. An article that really caught my attention was China purchased a massive amount of US corn for August delivery. What made it so massive was they purchased more than a years worth of corn (predicted) for just one month. A Chinese buying spree for U.S. corn is putting on display the ability of Beijing to reshape grain markets as well as the cost of food globally. China this past week bought 540,000 metric tons of U.S. corn for delivery after August, according to the U.S. Department of Agriculture, more than the 500,000 tons the agency forecast that nation would buy in an entire year. The news drove corn prices higher on Thursday and Friday, to settle at about $6.75 a bushel, giving new life to the market after a three-week slump. Now, traders believe that China is on the brink of buying millions of metric tons of U.S. corn, which would shatter the USDA forecast and keep U.S. grain supplies tight even as farmers tend to what is expected to be a record-large corn crop. The Chinese “are on the cusp, we believe, of needing a whole lot more corn than they can produce,” said David C. Nelson, a global strategist at Rabobank, a lender and investment banker to many of the world’s biggest food concerns. Why do they need so much corn?…their population has suddenly exploded overnight. So several possibilities popped into my mind. 1. They have had or are predicting to have, a disastrous crop in China. 2. For what ever reason they are propping up the price of corn (corn dropped after it became apparent the US was going to have a banner corn harvest). 3. The Chinese are predicting a global food shortage and decided with the price low, now is the time to pounce. Of course I really wonder in my infinite suspiciousness if 3 weeks ago, when the price dropped, the USDA didn’t fudge the US crop number as a favor to China causing the price to drop. 4…..way outside chance…China is preparing for war. So where does this leave us?…..nothing has really changed trend wise. The economy is still continuing to slowly degrade, and the world become less stable. Really the question is, what will be the tipping point? The house of cards needs to fall so something more substantial can take its place. The present extend and pretend is just making the landing from the fall that much harder. My worry is that it will be so hard that we cannot get back up. This entry was posted in China corn unemployment. Bookmark the permalink.